This device has reached End-of-Life. 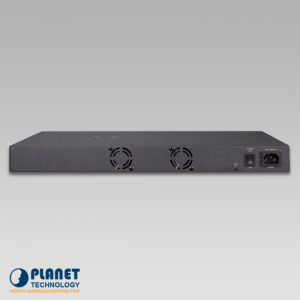 Planet Technology’s GS-5220-44S4C is a Layer 2+ Managed Gigabit Switch that features 44-Port 100/1000BASE-X + 4-Port Gigabit TP/SFP Combo, provides high-density performance and supports Hardware static Layer 3 routing in a 1U case. Each of the SFP slots supports Dual-Speed, 100BASE-FX and 1000BASE-SX/LX, meaning the administrator now can flexibly choose the suitable SFP transceiver modules according to the transmission distance or the transmission speed required to extend the network efficiently. 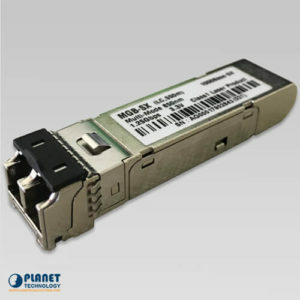 The GS-5220-44S4C supports SFP-DDM (Digital Diagnostic Monitor) function that greatly helps network administrator to easily monitor real-time parameters of the SFP, such as optical output power, optical input power, temperature, laser bias current, and transceiver supply voltage. Supporting both IPv6 and IPv4 protocols, the GS-5220-44S4C helps the data center / campus / telecom to experience the IPv6 era with the lowest investment as its network facilities need not to be replaced or overhauled if the IPv6 FTTx edge network is set up. Planet Technology USA honors its products that Planet and it's partners engineer and manufacture. Our products sold are of the highest standards available. All products come with a TWO year limited warranty on all products sold by directly by Planet Technology USA, unless specifically stated otherwise on our product documentation. This warranty period of two years applies from the ship date to all our products which are purchased legally and owned by the original customer. If you have purchased the product from a reseller you must contact the reseller directly. Should repairs fail to recover the product Planet Technology USA will replace the product with a similar product or a suitable replacement. Other information is as follows. Planet Technology USA is not responsible for any other cost incurred. All replacement units inherit the existing warranty. Expedited return can be fulfilled for a predetermined fee. An extended warranty may be purchased for eligible equipment. *Planet Technology USA assumes no responsibility for the risk of damage to any external devices (Devices that are not ours). It is the duty of the customer to check and make sure everything is compatible. The Limited Warranty applies only to products sold directly by Planet Technology USA that can be identified as a Planet Technology USA product (by name, logo, purchase documentation). The Limited Warranty does not apply to (a) damage caused by accident, abuse, misuse, misapplication; (b) damage caused by unauthorized service performed by anyone who is not an authorized Planet Technology USA service specialist (c) a product or a part that has been modified without the written permission of Planet Technology USA; or (d) if any Planet Technology USA serial number has been removed or tampered. Planet Technology USA warrants its products against defects in material and workmanship, under normal use and service, for the following lengths of time from the date of purchase. AC/DC Power Adapter, Cooling Fan, and Power Supply carry 1 year warranty. If a product does not operate as warranted during the applicable warranty period, Planet Technology USA shall reserve the right, at its expense, to repair or replace the defective product or part and deliver an equivalent product or part to the customer. The repair/replacement unit’s warranty continues from the original date of purchase. All products that are replaced become the property of Planet Technology USA. Replacement products may be new or reconditioned. Planet Technology USA does not issue refunds or credit. Please contact the point-of-purchase for their return policies. Planet Technology USA shall not be responsible for any software, firmware, information, or memory data of customer contained in, stored on, or integrated with any products returned to Planet Technology USA pursuant to any warranty. There are no user serviceable parts inside the product. Do not remove or attempt to service the product by any unauthorized service center. This warranty is voided if (i) the product has been modified or repaired by any unauthorized service center, (ii) the product was subject to accident, abuse, or improper use (iii) the product was subject to conditions more severe than those specified in the manual. Warranty service may be obtained by contacting Planet Technology USA within the applicable warranty period and providing a copy of the dated proof of the purchase. Upon proper submission of required documentation a Return Material Authorization (RMA) number will be issued. An RMA number is required in order to initiate warranty service support for all Planet Technology USA products. 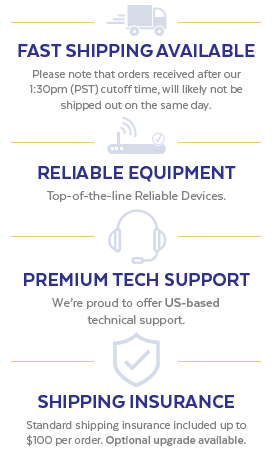 Products that are sent to Planet Technology USA for RMA service must have the RMA number marked on the outside of return packages and sent to Planet Technology USA prepaid, insured and packaged appropriately for safe shipment. Customers shipping from outside of the USA and Canada are responsible for return shipping fees. 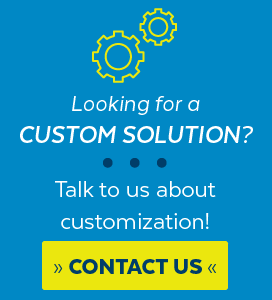 Customers shipping from outside of the USA are responsible for custom charges, including but not limited to, duty, tax, and other fees. WARRANTIES EXCLUSIVE: IF THE PLANET TECHNOLOGY USA PRODUCT DOES NOT OPERATE AS WARRANTED ABOVE, THE CUSTOMER’S SOLE REMEDY SHALL BE, AT PLANET TECHNOLOGY USA'S OPTION, REPAIR OR REPLACE. THE FOREGOING WARRANTIES AND REMEDIES ARE EXCLUSIVE AND ARE IN LIEU OF ALL OTHER WARRANTIES, EXPRESSED OR IMPLIED, EITHER IN FACT OR BY OPERATION OF LAW, STATUTORY OR OTHERWISE, INCLUDING WARRANTIES OF MERCHANTABILITY AND FITNESS FOR A PARTICULAR PURPOSE. PLANET TECHNOLOGY USA NEITHER ASSUMES NOR AUTHORIZES ANY OTHER PERSON TO ASSUME FOR IT ANY OTHER LIABILITY IN CONNECTION WITH THE SALE, INSTALLATION MAINTENANCE OR USE OF PLANET TECHNOLOGY USA'S PRODUCTS. PLANET TECHNOLOGY USA SHALL NOT BE LIABLE UNDER THIS WARRANTY IF ITS TESTING AND EXAMINATION DISCLOSE THAT THE ALLEGED DEFECT IN THE PRODUCT DOES NOT EXIST OR WAS CAUSED BY CUSTOMER’S OR ANY THIRD PERSON’S MISUSE, NEGLECT, IMPROPER INSTALLATION OR TESTING, UNAUTHORIZED ATTEMPTS TO REPAIR OR MODIFY, OR ANY OTHER CAUSE BEYOND THE RANGE OF THE INTENDED USE, OR BY ACCIDENT, FIRE, LIGHTNING, OR OTHER HAZARD. LIMITATION OF LIABILITY: TO THE FULL EXTENT ALLOWED BY LAW PLANET TECHNOLOGY USA ALSO EXCLUDES FOR ITSELF AND ITS SUPPLIERS ANY LIABILITY, WHETHER BASED IN CONTRACT OR TORT (INCLUDING NEGLIGENCE), FOR INCIDENTAL, CONSEQUENTIAL, INDIRECT, SPECIAL, OR PUNITIVE DAMAGES OF ANY KIND, OR FOR LOSS OF REVENUE OR PROFITS, LOSS OF BUSINESS, LOSS OF INFORMATION OR DATE, OR OTHER FINANCIAL LOSS ARISING OUT OF OR IN CONNECTION WITH THE SALE, INSTALLATION, MAINTENANCE, USE, PERFORMANCE, FAILURE, OR INTERRUPTION OF THE POSSIBILITY OF SUCH DAMAGES, AND LIMITS ITS LIABILITY TO REPAIR, REPLACEMENT, OR REFUND OF THE PURCHASE PRICE PAID, AT PLANET TECHNOLOGY USA'S OPTION. THIS DISCLAIMER OF LIABILITY FOR DAMAGES WILL NOT BE AFFECTED IF ANY REMEDY PROVIDED HEREIN SHALL FAIL OF ITS ESSENTIAL PURPOSE. Governing Law: This Limited Warranty shall be governed by the laws of the state of California. Some Planet Technology USA products include software code written by third party developers. These codes are subject to the GNU General Public License ("GPL") or GNU Lesser General Public License ("LGPL"). THIS WARRANTY AND REMEDIES SET FORTH ABOVE ARE EXCLUSIVE AND IN LIEU OF ALL OTHER WARRANTIES, REMEDIES AND CONDITIONS, WHETHER ORAL OR WRITTEN, EXPRESS OR IMPLIED, PLANET TECHNOLOGY USA SPECIFICALLY DISCLAIMS ANY AND ALL IMPLIED WARRANTIES, INCLUDING, WITHOUT LIMITATION, WARRANTIES OF MERCHANTABILITY AND FITNESS FOR A PARTICULAR PURPOSE. IF PLANET TECHNOLOGY USA CANNOT LAWFULLY DISCLAIM IMPLIED WARRANTIES UNDER THIS LIMITED WARRANTY, ALL SUCH WARRANTIES, INCLUDING WARRANTIES OF MERCHANTABILITY AND FITNESS FOR A PARTICULAR PURPOSE ARE LIMITED IN DURATION TO THE DURATION OF THIS WARRANTY. NO PLANET TECHNOLOGY USA RESELLER, AGENT, OR EMPLOYEE IS AUTHORIZED TO MAKE ANY MODIFICATION, EXTENSION, OR ADDITION TO THIS WARRANTY. PLANET TECHNOLOGY USA IS NOT RESPONSIBLE FOR DIRECT, SPECIAL, INCIDENTAL OR CONSEQUENTIAL DAMAGES RESULTING FROM ANY BREACH OF WARRANTY OR CONDITION, OR ANY OTHER LEGAL THEORY, INCLUDING BUT NOT LIMITED TO LOST PROFITS, DOWNTIME, GOODWILL, DAMAGE TO OR REPLACEMENT OF EQUIPMENT AND PROPERTY, ANY COSTS OF RECOVERING, OR REPRODUCING ANY PROGRAM OR DATA STORED IN OR USED WITH PLANET TECHNOLOGY USA PRODUCTS, AND ANY FAILURE TO MAINTAIN THE CONFIDENTIALITY OF DATA STORED ON THE PRODUCT. Some states and provinces do not allow the exclusion or limitation of incidental or consequential damages or exclusions or limitations on the duration of implied warranties or conditions, so the above limitations or exclusions may not apply to you. This warranty gives you specific legal rights, and you may also have other rights that vary by state or province. Shipping costs of products being returned are the responsibility of the customer. Cost of shipping products back to the customer will be paid by Planet Technology USA (Free ground shipping for USA - domestic customers only. International customers are responsible for shipping costs.) This warranty only applies to the customer whom purchased the product directly from Planet Technology USA. For products which are out of warranty, please call or fax in for a RMA number. Once the products for repair are received a quote will be generated for their repair. Customer approval must be obtained before work is begun in repairing or replacing the products. Once the products are repaired, payments must be made or sent for their repair costs before they are shipped back to customers. Shipping costs both to and from the customer are billed to the Customer for products which are out of warranty. 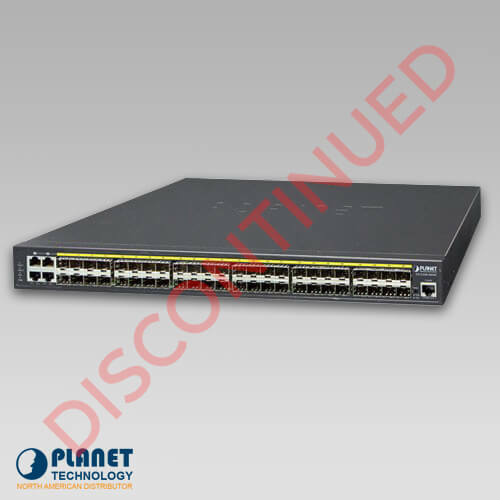 The MGSW-28240F features additional management features and offers 24 100/1000Mbps dual speed SFP Fiber ports. 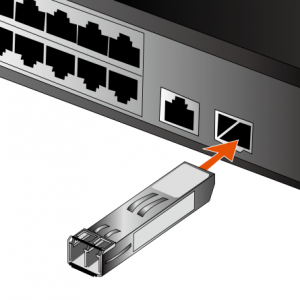 The unit also features 4 10Gbps SFP Fiber ports and 4 10/100/1000Mbps TP/SFP combo ports. The GS-5220-48T4X is a Layer 2+ managed Gigabit Switch that features 48-Port 10/100/1000Mbps + 4-Port Shared SFP + 4-Port 10G SFP+ and supports static Layer 3 routing in a 1U case. 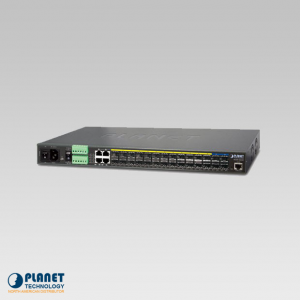 PLANET’s GS-5220-16S8C is a Layer 2+ Managed Core Fiber Switch that provides high-density performance and supports IPv4 and IPv6 hardware Layer 3 static routing and 24 100/1000Base-X dual-speed SFP slots in a standard 1U case. 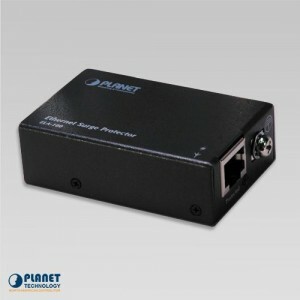 PLANET has released a new Ethernet Lightning Arrest Box, the ELA-100, to prevent Ethernet devices from possible damage caused by surge voltages as a result of lightning strikes. 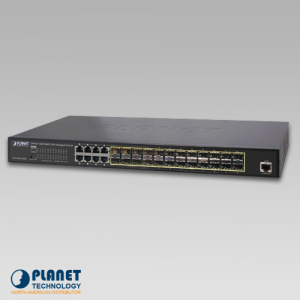 PLANET’s GS-5220-16S8CR is a Layer 2+ Managed Core Fiber Switch that provides high-density performance and supporst IPv4 and IPv6 hardware Layer 3 static routing and 24 100/1000Base-X dual-speed SFP slots in a 1U case. The MFB-FX by Planet Technology is an 100Mbps Fast Ethernet SFP Fiber Transceiver. 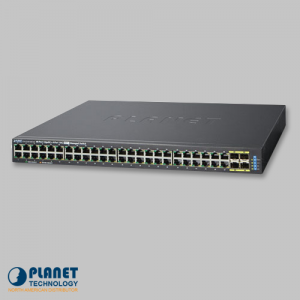 The MGB-SX by Planet Technology is an 1000Mbps Gigabit Ethernet SFP Fiber Transceiver. 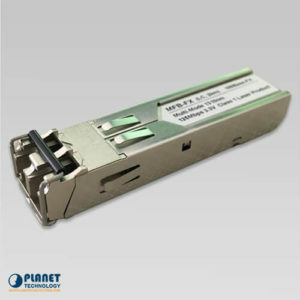 The MGB-SX2 by Planet Technology is an 1000Mbps Gigabit Ethernet SFP Fiber Transceiver. 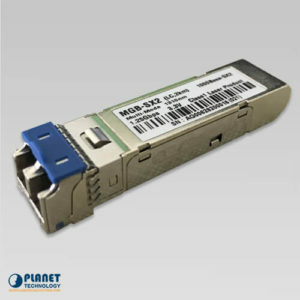 The MFB-F20 by Planet Technology is an 100Mbps Fast Ethernet SFP Fiber Transceiver. Mon - Fri / 9:00AM - 5:00PM PST. Get the latest on new networking devices, sales and offers. Sign up for Planet Technology USA's email newsletter today!